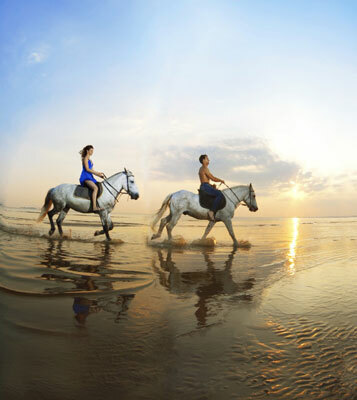 The Recompose tool in Photoshop Elements 11 is a combination crop-and-transform tool. You can move elements closer together or even change the orientation of a landscape shot from horizontal to vertical without eliminating your most important elements. In the Photo Editor, in Expert mode, select the Recompose tool from the Tools panel. This tool is just to the right of the Crop tool and looks like a gear in front of a bounding box. You can also press the W key to access the tool. Using the Brushes and Erasers in the Tool Options, mark the areas you want to protect and eliminate. Although this step isn’t mandatory, it yields better results. Mark for Protection brush: Brush over the areas of the image you want to protect, or retain (strokes are green). You don’t have to be super precise — just provide Elements with an idea of what you want to keep (or remove, in the case of the next brush). Mark for Removal brush: Brush over those areas you want to remove first (strokes are red). Make sure to choose the area you don’t mind deleting. Erase Highlights Marked for Protection: Use this tool to erase any area you mistakenly marked to retain. Erase Highlights Marked for Removal: Use this tool to erase any area you mistakenly marked to remove. Specify the other options in the Tool Options. Size: Adjust the brush size by clicking the down arrow and dragging the slider to make the brush diameter smaller or larger. Highlight Skin Tone (green man/brush icon): Select this option to prevent skin tones from being distorted when scaled. Preset: Use a preset ratio or size to which to recompose your image, or leave on the No Restriction default setting. Width and Height: Enter width and height scale percentages, if you want. Threshold: Set a recomposition threshold to help minimize distortion. Start with a higher percentage and then adjust as needed. Grab the image handle and resize your image. 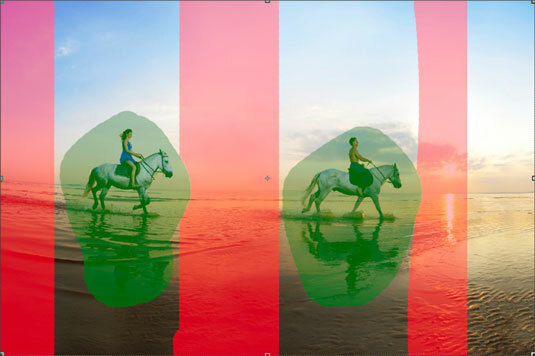 As you drag, the red areas are removed first, and the green areas remain intact. After all the red areas have been removed, Elements begins to “carve” out areas you didn’t indicate to protect. After you recompose the image, click the Commit (green) check mark icon to accept the composition. Retouch any areas as needed with the Clone Stamp or Healing tools.